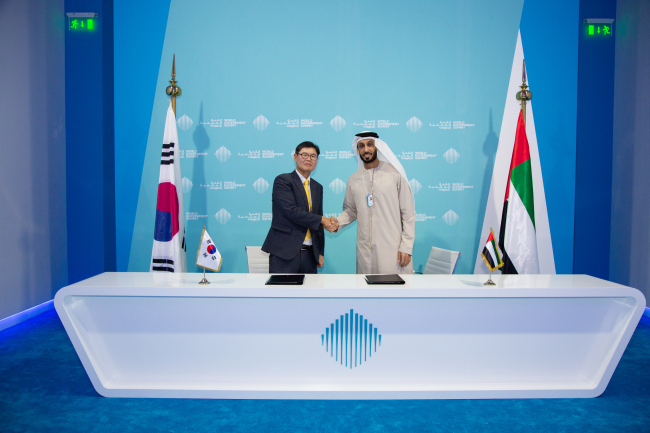 The Korea International Trade Association said on Tuesday it has signed an agreement with Dubai Future Foundation to set up a Korea Desk to help domestic startups better advance into the Middle East. The signing ceremony held in Dubai was attended by Kim Ki-hyun, chief of KITA’s United Arab Emirates office, Dubai Future Foundation CEO Khalfan Belhoul and key UAE government officials. Under the deal, KITA will set up the Korea Desk to provide diverse support, including providing coworking space, matching with Dubai startups and governments and holding investor relations. DFF is spearheading 11 technology innovation programs, including Dubai Future Accelerators and Dubai 10X. It is expanding national desks to support promising startups worldwide keen on the Middle East market. Currently, it has partnered with four nations, including Korea, New Zealand, Estonia and Latvia. “As Dubai is showing strong willingness to attract promising startups, this will be a good opportunity for Korean companies eyeing the Middle East,” said Kim Ki-hyun, chief of KITA’s UAE regional office.